Aquasonics Water Purifier will neutralize Chlorine and Chloramines present in tap water before you can put these harmful substances into your aquarium. 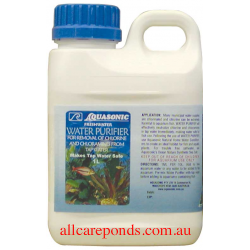 Suitable for use in both freshwater and saltwater aquariums, Water Purifier will work instantly. Best used pre-mixed in the new water being added to your aquarium. Pre-mixing salt it not necessary to use this product. 100mL will neutralize Chlorine and Chloramines present in 1,000L of tap water. A very cost effective and useful product. *Dose Rate: 1mL per 10 litres in new aquarium water. Extra Power Water Purifier is for situations when tap water quality is poor, when excess chlorine is present and evident by smell, or where water authorities may use chemicals that may harm fish. Extra Power Water Purifier will neutrilize excessive chlorine and chloramines, complete heavy metals and contains fungal inhibiters.